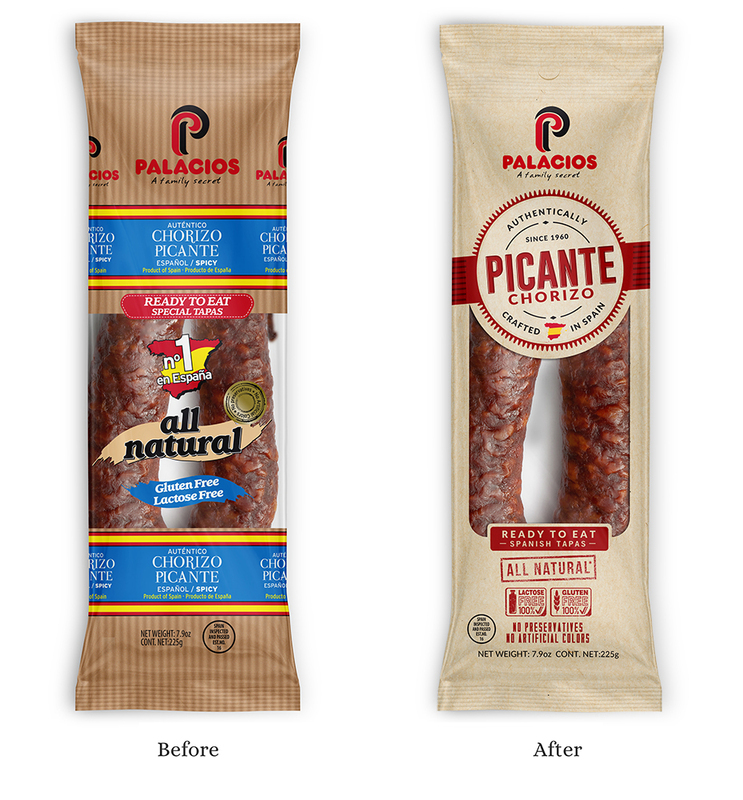 SHELF Packaging, a Tulsa Oklahoma based brand and packaging design consultancy recently rebranded Palacio's Spanish Chorizo product line. VISUAL ATTENTION ANALYSIS OR (VAS): a predictive algorithm, based on actual eye-tracking studies, to test for pre-attentive vision. This is the first 3-5 seconds of viewing— before we're aware of what we're looking at—and not affected by gender, age or culture. Post-attentive vision happens next, when your brain interprets what it's seeing. VAS helps ensure that your design is noticed in post-attentive vision as well. If it isn't noticed in the first place, how can it be processed? The original packaging had a lot of issues that needed to be addressed. 1: There was no sense of hierarchy. What is important? Where does the eye go? 2: Information overload. Needed to be simplified. 3: Blue is not a color U.S. Consumers associate with spicy. 4: Repetition around the packaging creates visual clutter. 1: Exhibits a clear flavor profile and information hierarchy. 3: Proper cultural color association for U.S. Market. 4: Health benefits are clearly organized and displayed. 5: Real Kraft Paper is more natural and pleasing to the touch than the simulated corrugated cardboard. The lighter colors will appear fresher and show better in poorly lit situations. Palacio's is a European leader in the Spanish food sector. Their executive team decided it was time to take their full-line of authentic products to the United States and Canada. Coming on the referral of another happy European executive they partnered with SHELF to rebrand their Spanish Chorizo product lines to better connect with the U.S. consumer. After the packaging redesign we have seen a sharp uptake in excited and motivated buyers across North America grocery and club channels. SHELF packaging has been very fortunate to work with several European CPG companies looking to expand in the North American marketplace. The story is still young but 2018 looks to be a historic year for this innovative company. Stay tuned for updates and additional product designs as we work through their deep product lines.